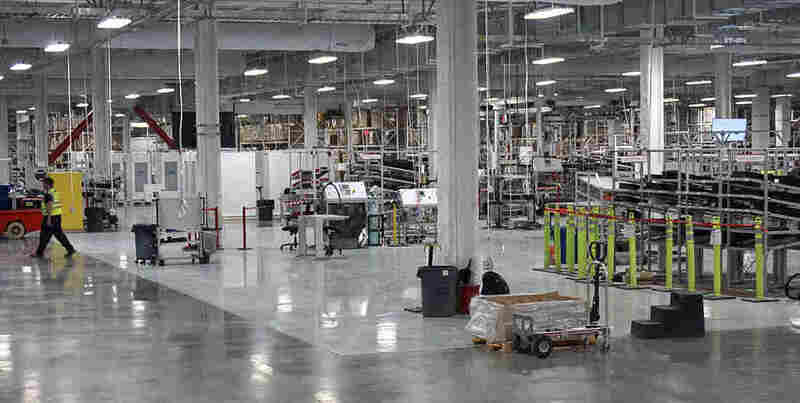 A Rare Look Inside The 'Gigafactory' Tesla Hopes Will Revolutionize Energy Use : All Tech Considered Tesla is building what it says is the world's largest battery factory. The scale is expected to drive down the cost of electric cars and batteries that homeowners can use to store surplus solar power. 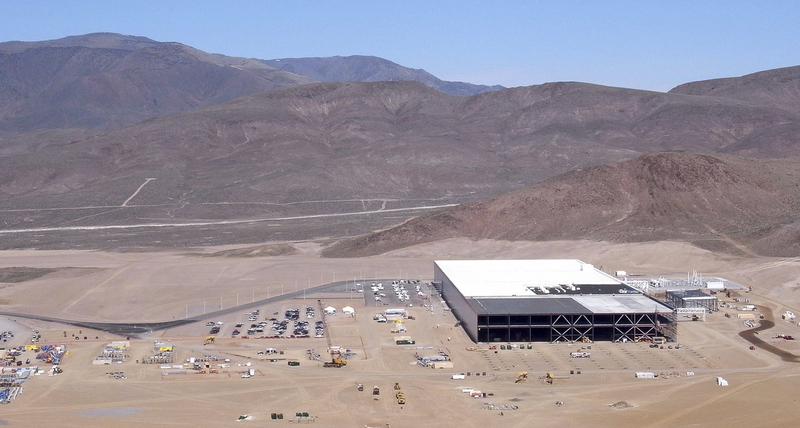 About 14 percent of the Gigafactory in Nevada has been built so far. At 5.8 million square feet, it will be a building with one of the biggest footprints in the world. "It's really hard to get a sense of scale. I mean, it's huge," JB Straubel, Tesla's chief technical officer, says while standing on the roof of the factory — the 14 percent of the Gigafactory that's been built, at least. We're looking down at a flat stretch of land where the rest of the Gigafactory — with an estimated price tag of $5 billion — will go. Like Willy Wonka's factory, there's a lot of hype around this place. People have been caught sneaking onto the property to see what Straubel says, at 5.8 million square feet, will be a building with one of the biggest footprints in the world. "I'm not a huge football fan, but I think it's on the order of around 100 football fields," he says. Nevada beat out several states by offering an incentive package worth more than $1 billion. State lawmakers are watching like hawks for the economic benefits, such as making sure Nevadans make up a big part of the factory's 6,000 workers. The production line at Tesla's Gigafactory is already operating for the Powerwall, a battery designed to store electricity from solar panels in average homes. One room is filled with huge metal tanks, like an insanely large industrial kitchen. It's where the raw materials are mixed together. In other rooms, the fully formed pieces of the battery, called the anode and cathode, are baked in huge ovenlike machines, several hundred feet long. According to Straubel, the equipment in the factory will double the world's capacity to make lithium-ion batteries. Tesla hopes to produce 35 gigawatt-hours of energy storage annually, which could supply 500,000 of its electric cars. "It's not just about building a lot more batteries but it's about reducing the cost," Straubel says. "Our vehicles can be more affordable. More people can have access to them," Straubel says. That's the company's goal with the new Model 3, Tesla's first mass market car, announced last month. The Model 3 will start at about $28,000 after the federal tax credit. "We have today over 325,000 reservations for Model 3, representing this enormous backlog of orders," Straubel says. Those are orders that Tesla can't fill if this factory isn't up and running. One room over, part of the factory is running, but it's making something else: the Powerwall. The flat battery, about 4 feet tall and 3 feet wide, is Tesla's first battery for residences. "If someone has solar on their house and they install a Powerwall, what this lets you do is store your surplus solar energy," Straubel explains. This is Tesla's ultimate vision: an electric car in your driveway and a Powerwall — priced starting at $3,000 — in your garage. It's a future free of fossil fuels, Straubel says. "That's changing the transportation landscape. It's changing the energy landscape. It's changing the world," Straubel says. Severin Borenstein, an energy economist at the University of California, Berkeley, agrees that it would be "a game changer for reducing greenhouse gas emissions." The question, he says, is whether consumers will buy into Tesla's vision. Some solar customers are paid by their electric utilities for the extra solar power they put onto the grid, a policy known as "net energy metering." That creates little incentive to store solar energy at home. 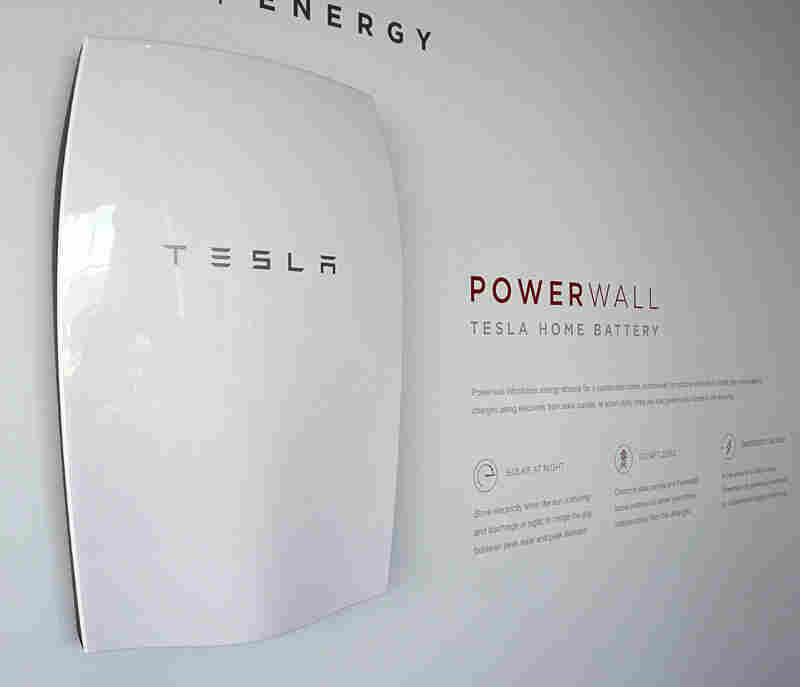 "Average households are not going to get much or any value from these batteries," Borenstein says. "They're people who like that and feel good about it and they're mostly pretty darn rich," he says. "Is Elon Musk far-seeing and investing in the future?" Borenstein asks. "Or is he making big bets that could all collapse at once?" The Gigafactory is exactly that gamble. If Tesla stays on schedule, it'll be fully open in four years.